Iraqi forces say they are pushing into the Old City of Mosul and closing in on a key mosque despite fierce resistance from Islamic State (IS) militants. Federal police chief Lt-Gen Raed Jawdat said officers were besieging the area around the Great Mosque of al-Nuri. The building was where IS leader Abu Bakr al-Baghdadi proclaimed the establishment of a "caliphate" in 2014. Gen Jawdat said police had also retaken the Qadheeb al-Ban district and the al-Malab sports stadium, to the west. Have combat changes increased civilian casualties? Iraqi government forces launched a major offensive to recapture Mosul, the last major IS urban stronghold in the country, in October. Supported by US-led coalition air strikes and military advisers, they have managed to retake large parts of the city and its surrounding area. They regained full control of all of eastern Mosul in January and have driven militants from several districts since starting an assault on the west on 19 February. On Wednesday, Reuters correspondents on the ground in western Mosul reported that helicopters were strafing IS positions on the edge of the Old City. Fleeing residents also said they had heard sustained gunfire inside the Old City. Gen Jawdat also announced that police forces had killed IS health minister, Saadallah Abu Shuaib, and his two guards near the Republican Hospital. 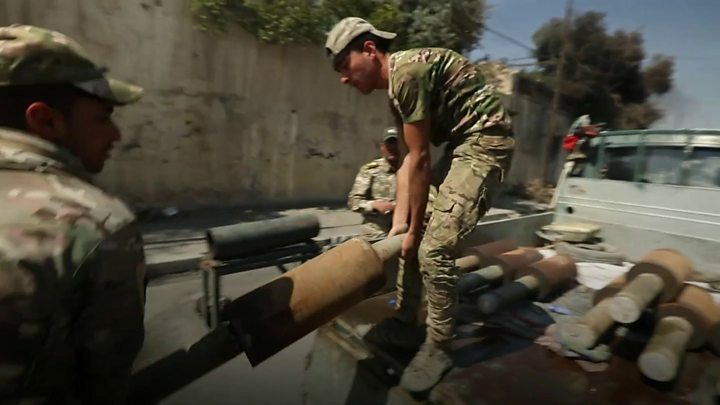 To the west in the town of Tal Afar, the Iraqi air force carried out several air strikes, destroying an IS security headquarters and two workshops making car bombs and booby-traps, the military's media office said. Meanwhile, Pope Francis said it was "imperative and urgent" to protect civilians in Mosul, where at least 307 people have been killed and 273 wounded in just over a month. It comes a day after the top US commander in Iraq said the coalition "probably had a role" in an explosion in western Mosul that killed as many as 200 people. But Lt-Gen Stephen Townsend added that IS might also have "had a hand" in it. A coalition air strike - reportedly targeting IS snipers and equipment - is believed to have hit a house in the Jadida district on 17 March. 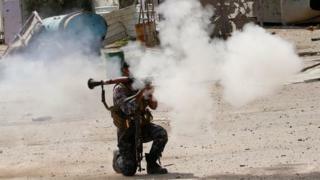 Witnesses told the UN that at least 140 civilians were being held there as human shields. They also said militants had booby-trapped the house with bombs. UN human rights chief Zeid Raad Al Hussein has also called on the coalition and Iraqi security forces to review their tactics in Mosul in light of the incident, urging them to avoid "traps" laid by IS and take every precaution to prevent civilian deaths. The rights group Amnesty International warned that any failure to take adequate precautions would be a "flagrant violation of international humanitarian law".